In the last three posts we made heavy use of bookmarks and cross-references. Since cross-references are common in technical documents, the reader will be happy to learn that you can create bookmarks and insert cross-references using keyboard shortcuts. To open the Bookmark dialog box, which we previously accessed via Insert/Bookmark, you can press Shift+Ctrl+F5. Turning to the Cross-reference window (which is not modal), there is no default shortcut to it. However, I suggest you assign Shift+Ctrl+R to it. 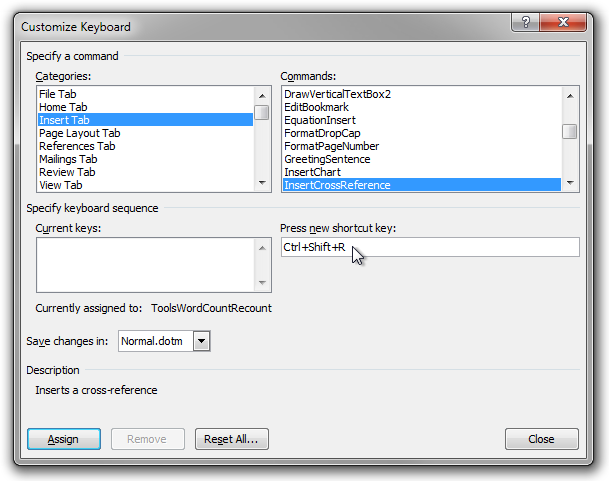 To do this, simply click File, Options, Customize Ribbon and then ‘Customize…’ next to ‘Keyboard shortcuts’. Select the ‘Insert Tab’ category and the ‘InsertCrossReference’ command. Put keyboard focus in the edit field below the ‘Press new shortcut key:’ label, and press the shortcut. Finally, press ‘Assign’. While still discussing convenient keyboard shortcuts, you should make sure you know about Ctrl+Alt+F which inserts a footnote.